Everyone wants to be fashionable when they go away on a trip, but who wants to pay the money or drag around a large bag? Lets face it, if you are flying, most of the time you are paying for your bag. And if you aren’t paying for your bag, do you really want to wait for the bag to get to the turn style or even at all? My husband and I have been traveling for the past seven years with only one bag that is overhead capable. I don’t mean weekend traveling, I mean, traveling in Europe for over two weeks. See pictures above. 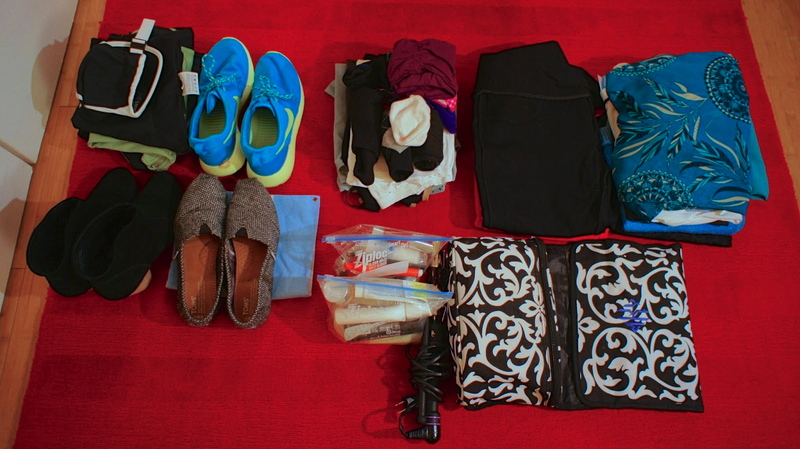 Ever since I met my husband, my travel packing style has changed. I use to be the one with the large roller bag for every trip. I have learned a lot from all our travels and I want to pass that knowledge over to you. Not only will you save money on the luggage, but you will save time as well not waiting for it at the end (if it even gets there!) of an exhausting trip. Here are a few tips that could help you for your next trip packing. Pack for three days, but account for a week. The experts call it force multiplication, but in my terms it means pack items that will increase the effectiveness of your clothing combination. Meaning, pick items that compliment numerous outfit combinations. Pants, you don’t need one per day. Two to three bottoms (shorts, skirt, dress) work. Jeans are a must so pick skinny or not. If you are bringing boots, bring the skinnies and sticky with that style. If they are new jeans, make sure you have worn them a few times. I made a mistake of wearing new jeans on a trip and I spent the entire time pulling them up. Very annoying. Your bag is important. I currently use Hayes X-Case Exotic because I wanted a roller. This one is super light. In fact it's the lightest roller available in this size - just 5 lbs! 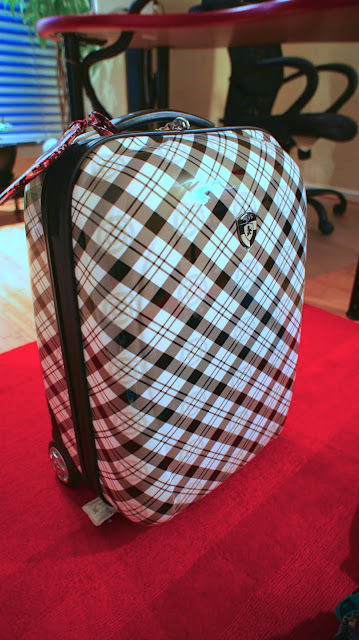 I also frequently use the eBags Mother Lode Convertible bag (as seen in the pictures above). One of these bags combined with a small cross body travel bag is a must. The smaller crossbody bag holds your purse (also crossbody), plastic baggies with travel liquids/gels, and entrainment items. It fits under the seat in front of you. The small crossbody bag is counted as a "small personal item". 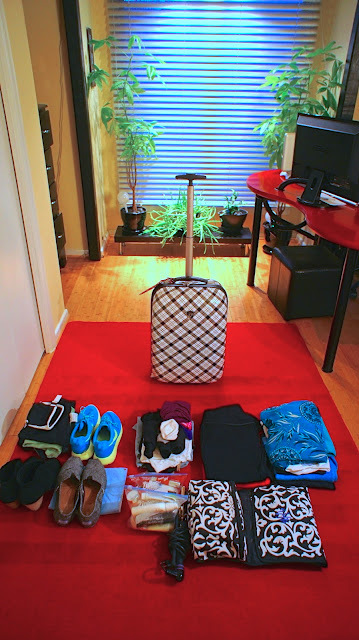 Layout all your clothing in front of you before packing it into the bag. You always can get rid of a few items when you see it all out infront of you. Undergarments. Ladies, you only need two bras (beige and black) and maybe a sports bra if you are planning to work out. You also dont need a pair of underwear for each day. Bring only a few pairs that you know are comfortable and work with your clothes. No polka dots or crazy colors either, neutral and comfy. You can always wash them in the sink and leave them to dry, which takes no time at all. The same goes for socks, only a few pairs. To save time going through security, put your liquids/gels in the pastic baggie in an accessible place. I always keep it in my smaller bag. There really isn't need to travel with tons of lotions, soaps, and shampoo/conditioner. One can get by using the stuff the hotel supplies. My skin is a bit sensitive so I do usually have a small travel lotion, but otherwise, stick with what you paid for in the hotel. If you are traveling with another person, communicate and make sure you dont bring multiples of things. I will admit that Jeff and I have brought the same toiletries. Bring a travel laundry detergent. It's invaluable when you want to wash you undergarments, socks, or even shirt. The only way I was able to travel for so long was washing my clothes and hanging them to dry. There were definitely times when we were staying in these ridiculously nice hotels with out clothes hanging up in the marble bathroom to dry. Most bathrooms have numerous place to hang your clothes and if you are lucky, an actual clothes line in the shower. Hotels expect this! Pick a color format. Brown or black. Wearing them together is no longer a faux-pas, but I still try to keep within one color choice with shoes and purse. Plan your outfits before hand. If the item hasn't been worn in a while, most likely you wont touch it on the trip and carry it around the entire time, wasting space. Plan the outfits that you will feel good wearing and make sure each item can go from day to night. Bring a scarf that has your colors from you clothes. My clothes usually are one color, but my scarf choice has many colors that match all the clothes. This way you wont look boring and neutral the entire time. Every time I wear this scarf I get complements. I bought it at the Gap for about five bucks and have used it for over a year now. Its perfect because it has orange, yellow, red, blue, black, and brown. It makes a plain shirts pop. Gold or silver - jewelry that is. If you are the type of person who mixes the metals, this does not apply, but if you can't break your rules then choose one. Don’t bring your expensive stuff either. Bring a long necklace, short necklace, maybe a statement necklace and few pairs of earnings (dressy and maybe some studs). A watch is always great too because it is jewelry, but also has a use for when your mobile doesn’t have service or work overseas. One sweater is enough. Preferably a button/zipper cardigan that is neutral and can be combined with a few outfits. I wore this yellow one for our twenty day trip (it was washed it once!) when we were traveling around Europe last summer. I was so happy to have it. I made sure it went with all outfits that I had packed so I could get the most use out of it. Shoes. Wear the bulky pair on the plane and bring others. A girl can’t live with just one pair, but don’t use all the room in your bag on shoes. Boots are great, but choose one pair. They take up so much room. If you need to bring heels, then choose one pair that you know you will wear. New shoes are almost always a bad choice if you know you will be walking around a lot. Make sure you have worn them a few times before brining them on a trip. Packing cubes. Enough said, they are awesome and really keep you organized. You don’t need your hairdryer. Seriously, every hotel has one these days. I always bring my curling iron because I know I will use it, but if you don’t curl you hair normally, leave it home. Technology, bring what you know you will need. You don’t want to be carrying around your heavy laptop if you aren’t going to use it. I know we cant all afford to have iPads, but they really are worth it if you travel enough. You can put movies and even blog using it if you need to. Chargers are another tech tool that aren’t needed in multiples. If you do bring a laptop, know that it can probably charge your phone and your SO's phone too! Airplane entertainment. Besides having an adult beverage, entertainment is important, especially if the flight is during the day and doesn’t have on-demand screens in the seats. I enjoy stocking up on magazines and then ditching them as soon as I am done. Don’t waste your money buying a magazine in the airport, they are so expensive. Travel journal. Jeff bought me a small travel journal of our first wedding anniversary (paper) and we have been using it since. We have our own style to recording our travels. When looking through it now, it brings us back to all the special places we've been. I wish we'd bought one earlier. Clean out your wallet. Gift cards, store credit cards, coupons, etc are not needed on vacation. You can save yourself some space and even maybe consolidate your necessities into a smaller wallet. Save space where you can. Don’t forget your driver’s license and forms of ID. If you are walking around a lot, bring good shoes, good socks, and some of this stuff. This blister blocker is awesome and small. Rain gear. Most hotels have umbrellas for you to use for the day, but a windbreaker is always a must if you know you will be outside. If it is the winter months, then you need your cold winter jacket (with hood), but windbreakers are fashionable and some even come in fold up tiny cases. P.S. Don’t forget your camera. Packing list If you are like me, you really like lists. If you tend to forget things like underwear, then you might want to check this list twice.